The camera lucida was invented by Dr William Wollaston and patented in 1806. They are less commonly seen and used these days but still play an important role in some observational sciences. I soon realised, in my work on Burgess Shale fossils, that explanatory drawings would be needed as well as photographs, to describe these fossils. This is where Dr Wollaston enters the scene -- a late 18th to early 19th Century physician, who practiced in London for many years, and made valuable contributions to chemistry and optics. He had a cracked shaving mirror, but instead of throwing it away he puzzled over the refractions and reflections of light caused by the cracks. This led to his realising that by inserting a prism into a microscope tube, the image could be directed laterally, then down on to paper beside the microscope, and provide a way to draw an accurate picture. In much refined form this is his invention, the camera lucida, which I used to make my drawings. Below is an artists using a camera lucida. 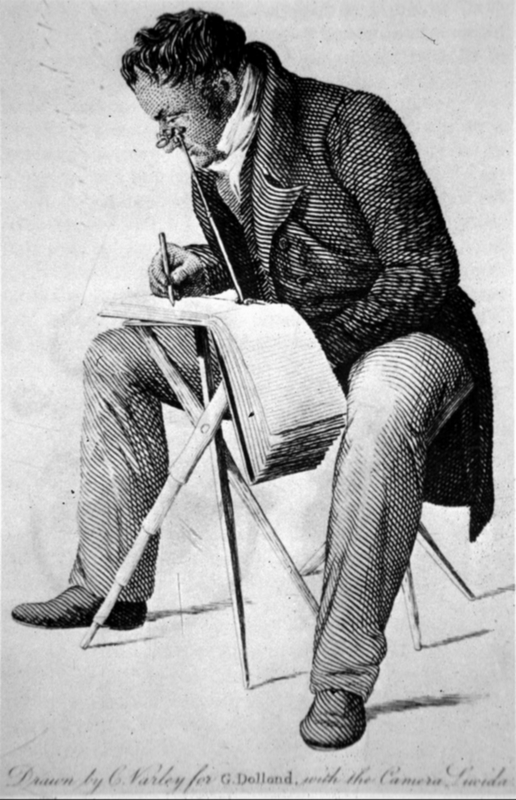 Artist Sketching With a Wollaston Style Camera Lucida. In: Dollond. George: The Camera Lucida. An Instrument for Drawing in True Perspective, and for Copying, Reducing, or Enlarging other Drawings. London 1830, frontispiece. Drawn by C. Varley for G. Dollond with the Camera Lucida.